Sydney started real preschool. If you recall last year we did a mother goose preschool with other ward members. 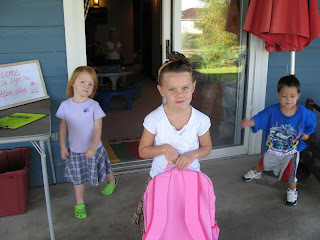 This year Sydney is going to Mrs. Julie's preschool on Tuesday and Thursday mornings. She is really enjoying herself! She especially loves having her "boy that is a friend" Jake Morris and her good friend Grace McConkie in class with her. I'm so glad she's liking preschool!! I really can't believe how big Sydney has gotten since you moved! What a cutie!! What a little beauty she is. I am glad she likes her school. We're doing Mother Goose preschool this year and we love it! Watch out for those boys that are friends! she is so beautiful. i bet she has some good stories to tell me abot school.